Brazil's new government is in trouble. Weeks after being installed, pending corruption-related impeachment charges against President Dilma Rousseff, interim President Michel Temer and his cabinet are drowning in corruption allegations of their own. Brazilian diplomat Paulo Almeida tells Sputnik that unfortunately, the worst is yet to come. Temer's official property assets, the paper noted, expanded rapidly between 2006, when he last ran for Congress, and 2014, when he was Dilma Rousseff's running mate during her re-election campaign, from an estimated $650,000 to $2.14 million. That's not counting the assets held by Little Michel and his other children. And this wasn't the only scandal involving Little Michel; the 7-year-old was entrusted to choose the new government's logo, causing a minor uproar among Brazilians, who are already infuriated over the interim government's moves to reverse over a decade of social advances by the Workers Party. And it's not the only scandal rocking the new government. In a twist of irony, Transparency Minister Fabiano Silveira, the minister in charge of fighting corruption, was forced to resign last week, only 16 days after taking the post, after a leak of a telephone conversation exposed him offering advice to Senate leader Renan Calheiros on how to undermine the so-called 'Car Wash' corruption scandal which has brought down a series of Brazilian officials over the last several months. His resignation in disgrace followed that of Planning Minister Romero Juca, who resigned last month over the leak of another telephone conversation, this time discussing how to put Temer into office. Those audio recordings led to charges that the new government had effectively overthrown Dilma Rousseff in a coup. Speaking to Sputnik on the problems facing the country and its political elite, Brazilian sociologist and career diplomat Paulo Almeida warned that together with corruption, the central problem facing Brazil today is the possibility of a great depression. "Today, it's not only political corruption inside the Congress or the government; the problem is that the Brazilian economy is in the middle of a big recession coming probably to a big depression." Almeida blamed the recession on the commodity boom of the past years, overspending and flawed economic policies. "I would call the whole situation today 'the Great Destruction'," Almeida warned. 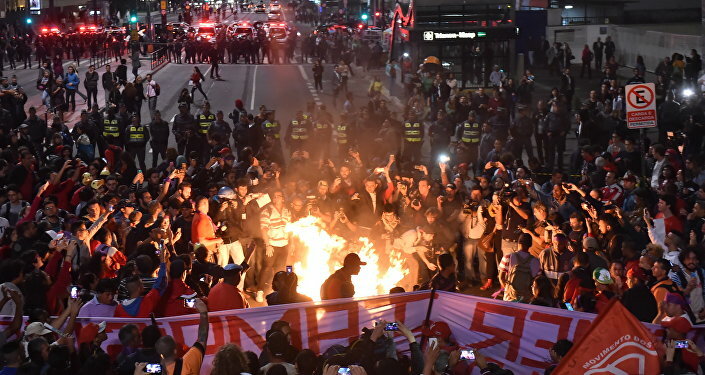 "You have had the Great Depression in the 1930s…nowadays we are seeing the beginning of the Great Destruction in Brazil…Besides the political side of the impeachment process, we are living in a big recession." As for Dilma's impeachment, the sociologist pointed out that, formally, "Rousseff was accused of only two crimes; one is disrespecting our budget; there is a law on the budget, and she overspent. And she has also authorized by decree many expenditures outside the budget. Those are the only two things that she's been accused of by the special committee on the Senate, and to be judged by August or September." Almeida insisted that the impeachment process was the only constitutional tool that the country has, but did not indicate the suspended president's chances of regaining her powers. Last week, Senator Gleisi Hoffmann told Sputnik that the new government and its actions were a "disaster," adding that Temer and his team are "not prepared to govern Brazil."